McKid and I try to go to the library every other Thursday. I load up the tote with a bunch of books, trying to fill it before she decides that she'll pick. Mostly because her idea of picking is just to randomly walk along the shelves and grab a book here and there and drop it in the bag. Without even looking at it. This bugs me, for some reason. Although I must admit, I'm not sure that we haven't had just as much luck with her method as with my more judicious searching of the shelves. This book so tickled my funny bone, that I had to stop and compose myself before I could read any more. Between nub heads, When Ponies Attack, and a chick named Spike, the book made me laugh from start to finish. 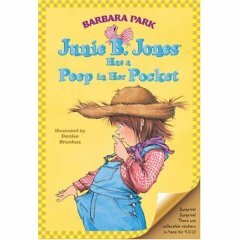 And yes, yes, one of the complaints about the series is that Junie B doesn't use correct grammar. People, it's written in the voice of a 5 year old. You can always use it as a teaching tool. All thumbs up from CasaS. We love Junie B! The favorite here is "Junie B Jones is a Beauty Shop Guy." I'm an English teacher and I don't mind the grammar. She's a little kid. I love how the author has nailed little-kid syntax. This page contains a single entry by MamaT published on November 29, 2007 5:22 PM. Winter Reading Challenge was the previous entry in this blog.